Penny and Stephanie have been serving on a Sullivan County Cohort to bring Creative Placemaking to the county and region. The function of Creative Placemaking is to bring economic and cultural development to a community through the arts. This work has been funded by a grant from the Americans for the Arts And the National Association of Counties through a two year grant including training and guidance while developing outcomes. The Cohort includes members from different sectors of the community as well as representation from key Arts Organizations in the county.We had far more entries than ever—168 pieces from 96 artists–and we were able to accept fewer pieces than usual as there is a separate show in the West Gallery during the Juried Regional this year. In future years, in response to the increased interest in entering this show, we will be sure to have both galleries available for the show so we can include more artists. 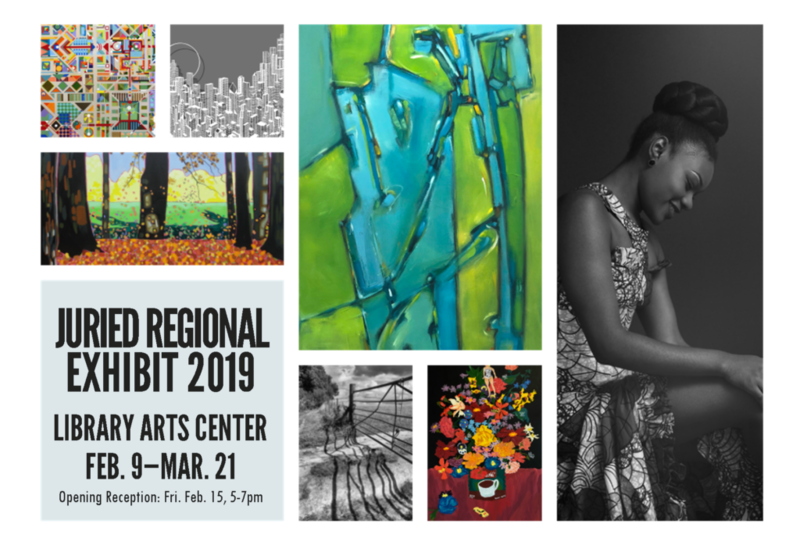 We hope interested artists will consider entering other upcoming exhibits at the Arts Center, including ROY G. BIV: All the Colors of the Rainbow, an open entry we have right now. This show will run this late spring into summer (May 4-July 25, 2019) and will feature art made with every color of the rainbow. To find out more about this exhibit, click HERE. The following artists elected to compete for an opportunity to display a larger body of their work at the Library Arts Center during the 2020 show season, and were selected by the jurors.